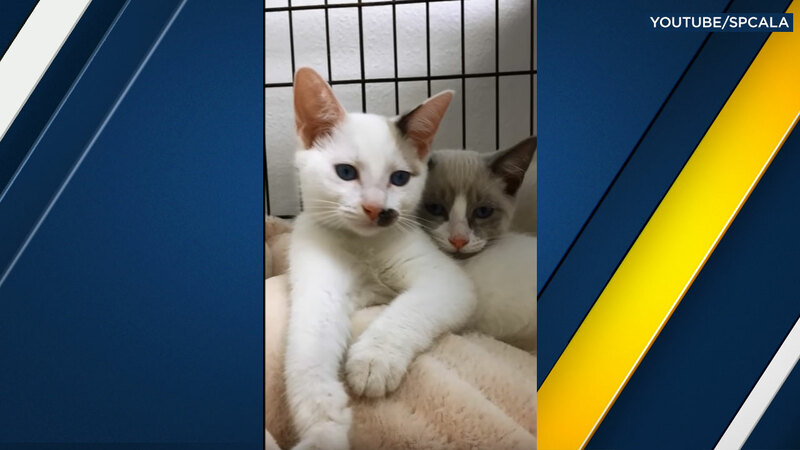 LOS ANGELES -- A mother cat and her four kittens are up for adoption at the spcaLA South Bay Pet Adoption Center after recovering from being left out in 104-degree heat inside a carrier in September. According to the adoption center, the family of cats were abandoned in a carrier and left outside the center on Sept. 26, when temperatures soared to 104 degrees. A volunteer found the cats hidden in an alcove. The mother, now named Heidi, and one of her 1-month-old kittens were panting and overheated. Their temperatures were taken and Heidi was found to be at 105 degrees when an average temperature for a cat should be around 101 degrees. The center's veterinary staff took in the cats and worked to reduce their temperatures while keeping them hydrated. Center staff said the quick actions of the volunteer and veterinary staff saved the cats and now that they have fully recovered are up for adoption. Heidi, Dolly Jill, Holly Anne, Polly Petunia and Molly Mae did not suffer any permanent damage from the ordeal. If you want to adopt them, you may go to the center located in Hawthorne at 12910 Yukon Ave.